Checking the flight mode annunciator after entering a command to ensure that the selected function is indeed armed or engaged, as appropriate. Including the flight mode annunciator in the scan to maintain continuous awareness of what mode is active and what is armed to activate next. Figure 4-4. 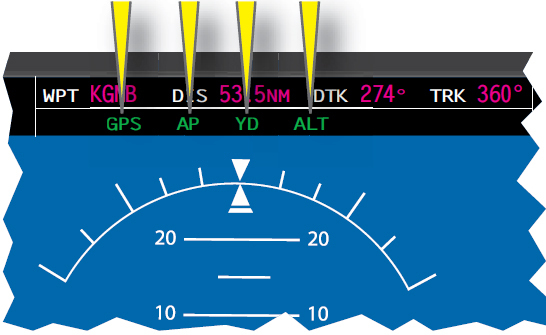 Engaged autopilot modes shown at the top of a PFD. When control of the aircraft is transferred between two pilots, it is important to acknowledge this exchange verbally. The pilot relinquishing control of the aircraft should state, “You have the flight controls.” The pilot assuming control of the aircraft should state, “I have the flight controls,” and then the pilot relinquishing control should restate, “You have the flight controls.” Following these procedures reduces the possibility of confusion about who is flying the aircraft at any given time. Using an FD/autopilot system can present an opportunity for confusion. When engaging the autopilot, it is a good idea to announce that the autopilot is being engaged, what autopilot mode is being used, and then to confirm the settings using the flight mode annunciator. It has been general practice for many years in many aircraft to first engage the FD to determine what instructions it was going to transmit to the autopilot. This is determined by reading the FD’s command bars. If the commands shown agree with your perception of the control motions to be made, then engage the autopilot to fly the entered course and vertical mode. A caution at this point: some FDs cancel the altitude hold mode when the autopilot is engaged. Always ensure that, after autopilot engagement, the desired modes are still active. The POH or aircraft flight manual (AFM) supplement for each FD/autopilot system contains a preflight check procedure that must be performed before departure. As with other preflight inspection items, this check allows you to ensure that the autopilot is operating correctly, before depending on it in the air. It is vital that you become immediately familiar with the procedures required to disconnect or disable the electric trim and autopilot systems. Electric trim and autopilot failures can occur in the form of failure indications; unusual, unexpected, or missing actions; or, in the extreme case, a runaway servo actuator in the autopilot or trim system. The first and closest method of disconnecting a malfunctioning autopilot is the autopilot disconnect switch, typically mounted on the control yoke. This switch is usually a red button, often mistaken by new pilots for the radio transmit button. You need to know which buttons activate which functions. Most systems may be disconnected by the mode buttons on the autopilot control panel. However, there are some failures (shorted relays, wires, etc.) that remove control of the servo actuator from the control unit itself. In those rare instances, the pilot must find and pull the circuit breakers that interrupt power to both the trim and autopilot systems. Some trim systems have separate circuit breakers for trim motors that operate different control surfaces (roll, pitch, yaw). Many pilots have installed small plastic collars on the autopilot to facilitate finding and pulling the correct autopilot circuit breaker to kill the power to that circuit. Ensure that you understand all functions and equipment are lost if those (and in fact, any circuit breaker) are disabled. In too many cases, a circuit breaker installed in an aircraft supplies power to more functions than the label implies. To be absolutely sure, check the wiring diagrams, and do not pull circuit breakers unless the POH/AFM directs that specific action. Another method of maintaining flight control when faced with a failed trim or autopilot system is the control yoke. Most autopilot and trim systems use a simple clutch mechanism that allows you to overpower the system by forcing the control yoke in the desired direction. This is usually checked during the afterstart/pretakeoff/ runup check. Demonstrate the proper preflight and ground check of the FD/autopilot system. Demonstrate all methods used to disengage and disconnect an autopilot. Demonstrate how to select the different modes and explain what each mode is designed to do and when it will become active. Explain the flight director (FD) indications and autopilot annunciators, and how the dimming function is controlled.